New Doctor Who actor David Tennant has come top of a TV industry magazine's ranking of the UK's best TV talent. The 34-year-old fought off competition from the likes of likes of TV chef Jamie Oliver and comedy star Catherine Tate in a poll of industry experts. Tennant shot to fame in the BBC drama Casanova earlier this year. TV veteran Bill Oddie took fourth place on Broadcast magazine's Hot 100 list on the back of the surprise success of his BBC Two nature series, Springwatch. 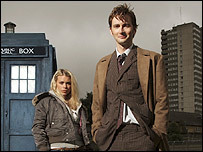 Broadcast said landing the role of one of TV's most iconic characters has propelled Tennant into the big time. "As yet we've had only the briefest glimpse of him as the Doctor, but if you missed his exuberant, charismatic, detailed performance as the eponymous hero in Casanova - where were you?" Oliver came second in the list after his Channel 4 series sparked a campaign to improve school dinners. I'm a Celebrity hosts Ant and Dec were placed fifth, with Broadcast saying they "stand head and shoulders above their presenting peers". ITV1's daytime host Paul O'Grady, Top Gear presenter Richard Hammond and Hardeep Singh Kohli, who created the Channel 4 show Meet the Magoons, also won praise.